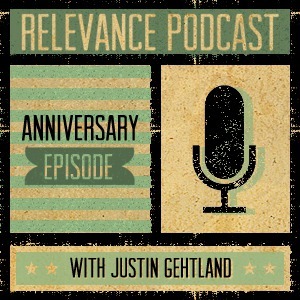 Way back at the end of 2011, I had this idea that maybe I could record some conversations with various Relevancers and throw together a podcast. Our very first guest was Justin Gehtland, so as the end of the year and the anniversary of the show approached, I thought it would be only too appropriate to have Justin on again. Besides, he's a great guest, and we were clearly overdue to have him on the show again. As is traditional for this time of year, we spent a good chunk of our conversation talking about the year gone by (verdict: it was crazy) and the year to come (verdict: it's super exciting). Justin chose "Mountain Song" by Jane's Addiction as the intro, and "Clean Elvis" by Dan Reeder to end the show.